NOTE: although Unity has now landed in Natty, some features such as the dash (the Ubuntu button) and the Applications/Files places have not landed yet. They should land ready for Alpha 2. Go to this page and download an ISO for your computer. It should be saved to the Downloads directory on your computer. When you start the application, it will likely automatically find the ISO you downloaded, which is displayed in the top pane. If you don’t see it, click the Other button and go and select the ISO (typically in your Downloads/ directory in your home directory). It is recommended you first erase your USB stick, so select it in the bottom pane and click the Erase Disk button. When this is complete, you can then use the slider underneath the Stored in reserved extra space slider to select how much disk space can be used for saving files, documents and other things. I personally move the slider all the way to the right to use the maximum space available. 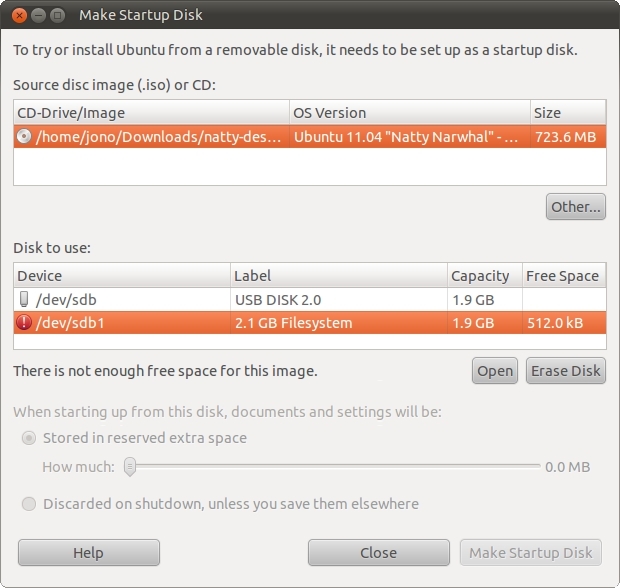 Finally, click the Make Startup Disk button and Natty will be installed to your USB stick. Now you need to boot from USB stick. To do this you may need to enter your BIOS to enable your computer to be able to boot from the USB stick. When this is enabled you will typically need to hit a button when you boot to see the BIOS’s boot menu (e.g. on my Thinkpad T400 it is F12) and then you can select the USB drive. Ubuntu should boot and look and function the same as usual, apart from being much slower as you are running from the USB disk. Although Natty is still very much in the early stages of development, we want to know when you experience bugs. If we don’t know about the bugs our community can’t fix them! The ubuntu-bug program zips up some debugging data from your system and will then fire up a page in your browser where you can enter a bug report. This will then provide details of the problem to the Unity developers to help fix the bug. This page has instructions for getting debugging packages and info installed which can lead to better bug reports. According to seb128 the debugging page is a bit out of date so I am wrong, “ubuntu-bug unity” is the best way to report bugs, sorry for the confusion. Hi Jono, thanks for posting this. Unfortunately, there appears to be a bug in the utility for creating the startup disk which prevents you from using the slider to select how much space should be reserved. The workaround is to move the ISO to a location that isn’t automatically detected by the utility (like /tmp) and select it manually using the “Other…” button. When will you upload Unity to Debian? First let it work for ubuntu… then some one in the debian community can copy it over… why should people at canonical do that…. If I understand correctly, you should actually leave a bit of extra space if you want updates to work properly. This procedure works even with nvidia chipsets? noveau dirvers are not enough, from what I know, to launch Unity. No it doesn’t work with nvidia cards unless you install proprietary drivers. Some other cards are blacklisted as well. If 3d is not available, you will get gnome panel and metacity. So I can’t never try Unity unless I install Natty on a second partition and I will not do it. Jono, when you say “install” do you mean after you make the start-up disk to then install it to the USB stick? I don’t find from the start-up disk that I can access a terminal to do the updates you suggest. Nouveau is easily capable of that, I’ve used it with compiz, it’s more fluid than the proprietary drivers, by a lot, and the only stability problems I had were from the lack of power management overheating (and maybe destroying, we’ll see if I can fix it..) my laptop. You just have to install experimental mesa or whatever that uses it. If you can get a version new enough to have half decent power management, you can have an awesome compiz-fueled experience. I installed the latest version yesterday on my USB, wanted to try unity. After booting in I got the classic Ubuntu ui(not unity), so I logged out(hoping I could choose unity from the login options). When trying to log in I had to add username and password, but I had none..
Hi Jono, Testers may also want to consider a full installation onto a USB stick/drive, rather than running it live. Old (small) laptop drives work well for this. Throw them in a USB caddy, format, install, and go! No mention of the L word. Although I would say that has less to do with spirit than strategy and usability. People can handle a finite amount of options for any given choice they have to make. 3 is probably about the limit of that. Can someone point me at a screenshot of what Unity should look like, I’m not sure if the Live version is giving me that or some of the other desktops mentioned above. Thx. Does this also work on systems with an Nvidia card? Because the GLX drivers are not on the CD/ISO? I get the Try Ubuntu or Install Ubuntu screen. When I “try ubuntu”, it loads a live environment that doesn’t persist after reboot. If I try to install, well, it tries to install to my hard drive. What am I missing? I used to do this just fine when we weren’t welcomed by the “try ubuntu” or “install ubuntu” screen. That’s what happened to mine Shane. I was under the impression that this would be a persistent version of Natty. I missed the step that enables the usefulness of this project. A couple of things that I noticed. Nvidia doesn’t work out of the box with free drivers. And you are unable to install proprietary drivers on UsB drive. Which is connected with the second problem. Persistent file isn’t really persistent. If you create a file in /home/ubuntu and reboot, the file will disappear. Thanks for the guide Jono. Am pleased to report that on my little laptop here (Vaio, Intel Core Solo @1.2GHz, 1GB, i915 graphics) Unity feels much snappier than Maverick standard Gnome desktop. Exciting stuff. Note that if you allocate all the free space for documents, it doesn’t leave space for the system. So then if you try upgrading a kernel or installing a kernel driver, it can fail and leave the usb key in an unusable state. So my advice would be to leave at least 800M unreserved for system files.